Steven Mill 6 years, 2 months ago. These bulbs are made from a cluster assembly of small solid state light emitting semiconductors that work by the principle of electroluminescence. Even though these diodes were originally small in size and produce a weak intensity of light, they have been improved to be brighter. The grouping design is also made to resemble the shape of the incandescent lamp and the connector is made to fit outlets that were designed for the incandescent lamp. These bulbs are advertised to use only a third to a tenth of the amount of energy other kinds of lamps will use to produce the same amount of light. As their name indicates these lamps are fluorescent lamps constructed in a compact shape and size. The working principle here is using electrical discharge to excite a small trace of mercury vapor – which is trapped in a glass tube that is coated with a fluorescent material – so that it produces ultraviolet light. The ultraviolet light causes the fluorescent coating to produce bright visible light. In order to support the discharge across the tube, electronic ballast is housed in the base of the bulb. This process uses only one third to one fifth of the energy an incandescent lamp would use to produce equivalent amount of light. Efficiency: LED bulbs use close to a third of the amount of power CFL bulbs would use to produce the same amount of light. This makes them the ideal choice in portable applications for the purpose of extended battery life. Durability: LED bulbs last ten times longer than CFL bulbs. Additionally, the lifetime of a CFL bulb tends to drop drastically when it is used in a frequently cycled application. LED bulbs also exhibit a far better performance in a vibratory application. Cost: The complex manufacturing process of semiconductors makes LED bulbs expensive on the market. LED manufacturers rationalize this fact by the bulbs longer life time and energy efficiency. 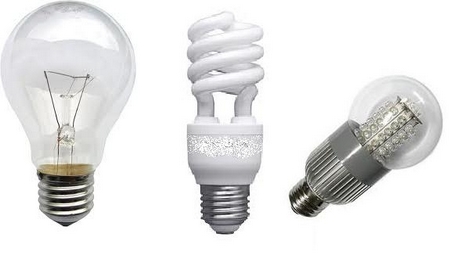 Environment: The traces of mercury in CFL bulbs will be spilled when the glass is broken. The smallest amounts of mercury vapor are toxic to the human body and cause nervous system problems. Mercury is not used in LED bulbs. Versatility: CFL bulbs are limited to general lighting applications while LED bulbs could range in size, color and shape. LED bulbs could be used from decorative to heavy duty industrial applications. What do you think about this comparison between LED and CFL? Is there any others pros or cons in terms of efficiency, durability, cost, environment or versatility? The IEC recently issued an interresting paper about how to appreciate the efficiency and comfort of these lighting bulbs: “Watt? No. Think Lumen!”. The link is not opening, or either you can say page is not found. Appart from more mfg. cost,LED requires more installation space,other factors remaining identical.Hence in terms of initial cost cfl is in positoin of advantage.Moreover,everyone highlights the longevity factor of LED,which is often manufacturer guaranteed,but no one talks about life of costly LED Drivers,which is never guranteed. Has anyone thought about the reactive power in LED and CFL’s? Energy suppliers won’t be happy with this. As a customer I’m not complaining, but supplying energy at factor 1 and only receiving money for a factor 0,8 or worse? One must consider the cost of ordinary bulb vis a vis CFL or LED. CFL and LED contains mercury which cannot be removed from the substance and is non destructible and also harmful for human life. Induction Lights are another good source. They do use mercury unlike the LED ones but with a life of 5-7 that of Metal halide and 50% less energy use they are worth considering. Have we no direct answer.The main problem I have is colour.LED seem to have too much blue,the eco have too much red.Both use less watts of power than tungsten and longer life. Do you know of any study made to compare the reactive power and hence effect on PF of CFL vs LED lightings? I believe the kVAR produced by the CFL’s and LED’s are very small. CFL’s can be considered as a resistive load, thus producing very small amount of kVAR. On the other hand, LED is a nonlinear load, so this may affect the whole system’s pF because of the Harmonics Distortion that it may cause. The only disadvantage stems from higher cost of LED (at least to the present). The savings in energy use more than compensate over CFL.